LINTHICUM, MD (August 01, 2015)—The First Mt. Olive Freewill Baptist Church in Linthicum, MD will be the site of the Back to School Gospel Explosion, a star-studded evening of music that benefits five local schools to help provide supplies and uniforms for students. The concert is the first of its kind for the event’s organizer, seven-year-old, Makenzee Adams, also known as The Little Boss. In 2014, she became the youngest recipient of the Epnet Legacy Rising Star Award. 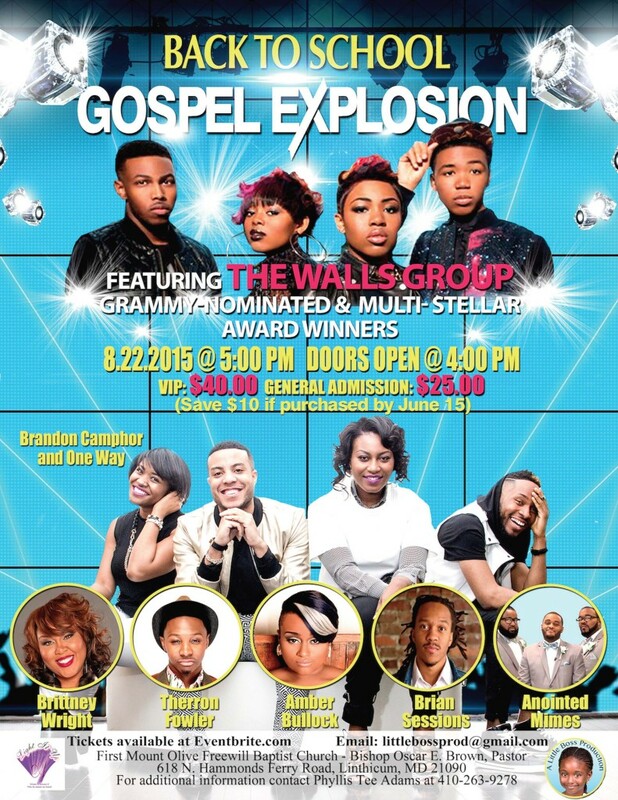 The concert will be hosted by well-known life coach and motivational speaker, Kashonna Holland and Comedian, Actor and Radio Personality, Shed G. The Back to School Gospel Explosion boasts an impressive lineup of recording artists and performers and features the Grammy-nominated The Walls Group who were also nominated for eight Stellar Awards. Gospel artist, musician and BET singing competition winner, Amber Bullock will be performing; as well as the dynamic group, Brandon Camphor & One Way; and recording artist, Therron Fowler. Singer, songwriter, vocal arranger and recording star, Brittney Wright, will perform and attendees will enjoy a unique performance by the Anointed Mimes. Brian Sessions will present a spoken word message and the Community Dance Troop will perform. Through her company, Little Boss Productions, Adams is conducting the event to help students unable to afford supplies and uniforms for school. Annapolis schools that will benefit are Walter S. Mills-Parole Elementary, Wiley H. Bates Middle School, Annapolis Middle School and Annapolis High School’s theatre and arts department, along with the music department of North Bend Elementary/Middle Schools in Baltimore. The concert will be held on Saturday, Aug. 22, 2015 at the First Mt. Olive Freewill Baptist Church, located at 618 N. Hammonds Ferry Rd. in Linthicum, MD. Doors open at 4 p.m. and the concert begins at 5 p.m.
Tickets purchased before Aug. 22, 2015 are $30 for VIP seating and $15 for general seating. There will be no VIP seats sold at the door, but general admission seating will be $25 at the door. Those who are unable to attend can make a donation via PayPal. The Back to School Gospel Explosion provides a unique opportunity to enjoy performances by some of the gospel music industry’s premiere artists and entertainers, while helping children in need. The concert is one more way in which Adams is aiding her community and helping young people achieve their full potential. For more information about the event or to become a sponsor/partner, call Phyllis Adams at: 410-263-9278 or email at littlebossprod(at)gmail(dot)com. You can also visit http://www.littlebossproduction.com. Makenzee Adams, also known as The Little Boss, has been giving back to the community since the age of 4. She’s helped feed the homeless at the local homeless center, distributed self-designed “Somebody Cares For You” T-shirts to the homeless, and coordinated a Back to School Gospel Go-Go to fund a safe place for youth and help those battling cancer. She’s the youngest recipient of the Epnet Legacy Rising Star Award that honors those from throughout the nation who have made significant contributions to their community. She’s a third generation business partner with Light It Up With Triple A, a professional lighting company in Annapolis, MD.